The ongoing West African Ebola epidemic is officially the most deadly on record, and the number of infected persons is steadily rising. Donna Patterson, assistant professor of Africana studies, writes and teaches about Africa and global health issues and has been traveling to the region most affected by the outbreak for almost 20 years. She reflects on why we should be paying close attention to the outbreak. Ebola is highly infectious and can be transferred from one person to another in negligible amounts. In the past two weeks alone the death toll has increased by more than 20 percent. The numbers keep growing despite early efforts to reduce transmission. The incubation period is long, up to 21 days, which provides ample time for the disease to develop in individuals who may be traveling or just out and about, and thereby spread over longer distances and across borders. Patterson, a historian of Africa and the African Diaspora, has focused much of her work on pharmaceuticals, global health policy, gender, and the history of medicine. This outbreak is unprecedented for many reasons: the speed and sustained pattern of infection, its existence in some high-density settings, and its emergence in the West African subregion. It arrived without any forewarning and within a matter of two weeks 80 cases were confirmed. By late May, it seemed as if the epidemic would subside like previous cases but in June, cases and deaths spiked and the disease began to take hold in new areas. This outbreak has already reached the borders of Mali, Guinea-Bissau, and Cote d'Ivoire and it is very near Senegal. If it somehow makes its way to large urban areas like Dakar, Senegal, or Abidjan, Cote d'Ivoire, it will have greater access to the West. For instance, Dakar has a population of two million inhabitants with regular flights to several cities in the United States and Western Europe. Delta and South African Airways fly directly from the United States to Senegal and numerous carriers fly between Senegal and countries that include France, Germany, and the Netherlands. An infected person in the incubation stage of the illness could easily spread the disease to the United States or Europe on an international flight. A flight from Dakar to New York is shorter than a flight from Paris. The sustained spread of the disease coupled with multiple transmission sites makes it difficult to control. 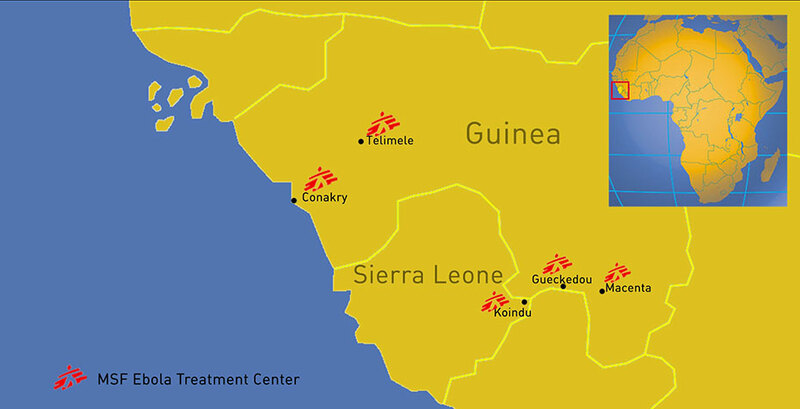 Guinea, Liberia, and Sierra Leone already had some constraints on their public health resources and were not prepared to manage an outbreak of this magnitude. Even with international reinforcements, public health workers are seemingly beginning to fight a losing battle. Currently, there is no cure for Ebola, but medical interventions such as intravenous fluids can help reduce the mortality rate. To help stem the spread of the virus, it is imperative that current public health efforts continue and are bolstered with more support from regional and global health partners. Health officials in the affected countries and many in neighboring countries responded with the help of foreign global health agencies such as the World Health Organization, Centers for Disease Control (CDC), and Doctors Without Borders - Médicins Sans Frontières. But increased support in the form of personnel, medical supplies, and coordination would help to slow the spread of the virus from reaching new sites in the West African subregion and other continents. As global health security becomes increasingly interconnected, it is crucial that the Global South be a major stakeholder in global health security. The CDC's relationship to local African health professionals is critical in containing Ebola and this continuing epidemic highlights West Africa' significance to global public health. Donna Patterson teaches courses on global health and African and African Diaspora studies. She is the author of Pharmacy in Senegal: Gender, Healing, and Entrepreneurship, (Indiana University Press, 2014).